36 gal. 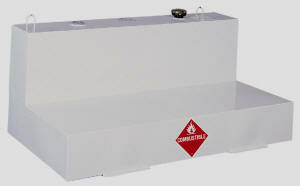 Vertical Liquid Transfer Tank is made from 14-ga. reinforced steel withstand the toughest use. Transfer Tanks feature full-center baffles for extra strength and 2″ NPT reinforced bungs and tie down for stability. Cap and coupler lock yet provide outside venting. Move empty tank with built-in lifting rings. Vertical Liquid Transfer Tank measures 59–5/8″W x 19″H x 9″D . Warning: These tanks cannot be connected to an existing fuel system under any circumstances. Tanks are registered by State Law. Contact the local Fire Chief and State Fire Marshall for local codes. Note: Tanks meet D.O.T. 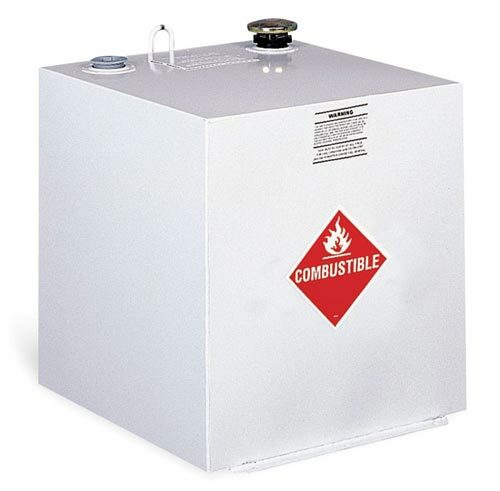 requirements for Combustible Fuels only. Tanks are not designed for and do not meet D.O.T. requirements for flammable fuels. Gasoline is a flammable fuel. 50 gal. 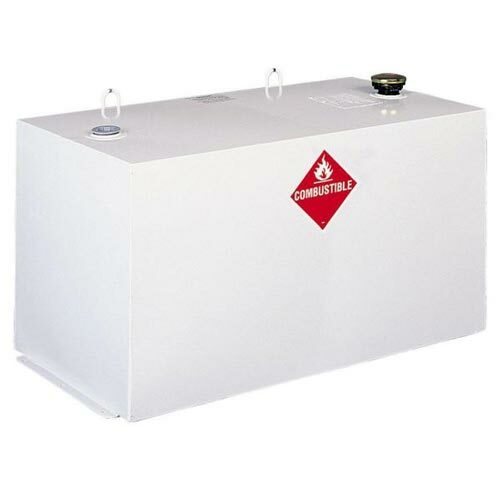 Square Liquid Transfer Tank is made from 14-ga. reinforced steel withstand the toughest use. Transfer Tanks feature full-center baffles for extra strength and 2″ NPT reinforced bungs and tie down for stability. Cap and coupler lock yet provide outside venting. Move empty tank with built-in lifting rings. Square Liquid Transfer Tank measures 23–1/4″W x 24″H x 23–1/4″D. 78 gal. L Shape Liquid Transfer Tank is made from 14-ga. reinforced steel withstand the toughest use. Transfer Tanks feature full-center baffles for extra strength and 2″ NPT reinforced bungs and tie down for stability. Cap and coupler lock yet provide outside venting. Move empty tank with built-in lifting rings. Rectangle Liquid Transfer Tank measures 48″W x 25″H x 31″D. 100 gal. 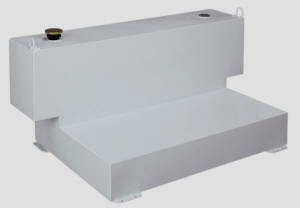 Rectangle Liquid Transfer Tank is made from 14-ga. reinforced steel withstand the toughest use. Transfer Tanks feature full-center baffles for extra strength and 2″ NPT reinforced bungs and tie down for stability. Cap and coupler lock yet provide outside venting. Move empty tank with built-in lifting rings. Rectangle Liquid Transfer Tank measures 45–1/2″W x 24″H x 23–1/4″D. 100 gal. Notched L Shape. 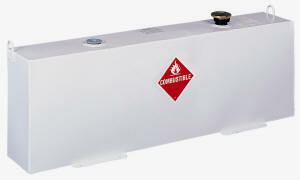 Liquid Transfer Tank is made from 14-ga. reinforced steel withstand the toughest use. Transfer Tanks feature full-center baffles for extra strength and 2″ NPT reinforced bungs and tie down for stability. Cap and coupler lock yet provide outside venting. Move empty tank with built-in lifting rings. Rectangle Liquid Transfer Tank measures 60–1/4″W x 25″H x 33″D. 100 gal. L Shape Liquid Transfer Tank is made from 14-ga. reinforced steel withstand the toughest use. Transfer Tanks feature full-center baffles for extra strength and 2″ NPT reinforced bungs and tie down for stability. Cap and coupler lock yet provide outside venting. Move empty tank with built-in lifting rings. Rectangle Liquid Transfer Tank measures 59–5/8″W x 25″H x 31″D.